Multistep industries (WA) Canning Vale is the market leader in the production and wholesale of high-quality food packaging in the fresh produce, meat and bakery market. Andrew (company manager) suffers allergies particularly Asthma and the dust and forklift tyre rubber were building up after moving into their new warehouse. Multistep stock plastic containers for the fruit industry like strawberries and blueberries etc. They have a high turnover of stock and the forklifts and trucks were creating a lot of dust. 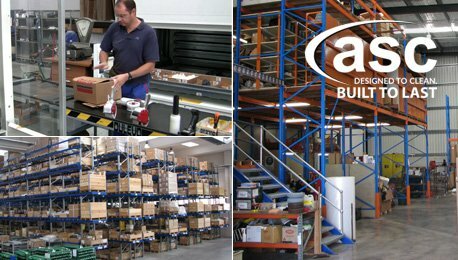 Prior to investing in the ASC dust free manual MEP sweeper, they were using a petrol powered blower to clean their warehouse. The investment in the MEP sweeper with its vacuum and filter has made the job of cleaning a lot quicker and with the elimination of airborne dust. ASC’S Ross Sheehan personally delivered the new labour Saving ASC MEP sweeper.